Rumah Sakit Umum Pusat Dr Sardjito Yogyakarta - RSUP Dr Sardjito is a well-established state-owned general hospital in Indonesia. RSUP Dr Sardjito was established in 1982 and is fully-owned by the Government of Indonesia. RSUP Dr Sardjito operates directly under the Ministry of Health Republic Indonesia through Directorate General of Health Efforts. 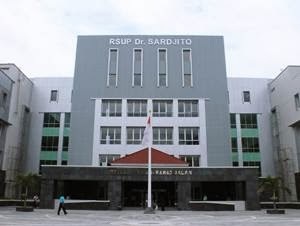 RSUP Dr Sardjito is domiciled in Yogyakarta and located at Jl Kesehatan Sekip Sleman Yogyakarta. RSUP Dr Sardjito is a hospital type A, that means in addition to health care but also the teaching hospital. According to information found in RSUP Dr Sardjito's website as cited by JobsCDC.com, RSUP Dr Sardjito is a reference hospital in Yogyakarta and Southern part of Central Java regions. RSUP Dr Sardjito offers services through 813 beds, including 16 Suite Rooms, 28 VVIP A, 2 VVIP B, 9 VIP B, 42 VIP, 6 main class, 67 class I, 340 class II, and 303 class III. RSUP Dr Sardjito directly employs nearly 3,015 staff. JobsCDC.com now available on android device. Download now on Google Play here. Please be aware of recruitment fraud. The entire stage of this selection process is free of charge. RSUP Dr Sardjito Yogyakarta - D3, D4, S1, S2 Non CPNS RSUP Dr Sardjito February 2018 will never ask for fees or upfront payments for any purposes during the recruitment process such as transportation and accommodation.